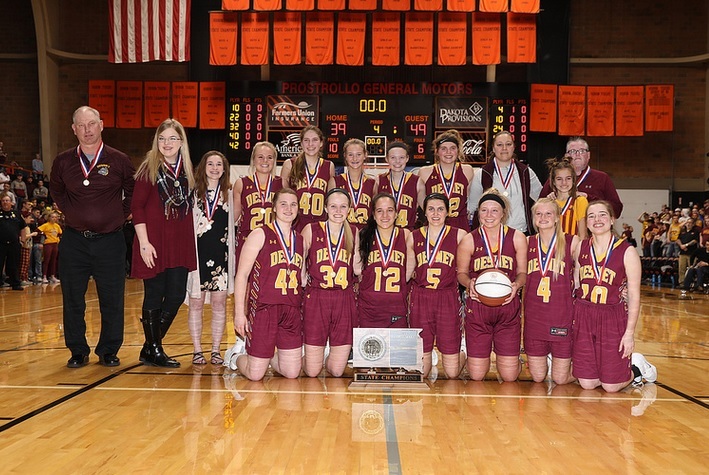 DeSmet won the Girls Class B State Basketball Championship Saturday night with a 49-39 win over Ethan. HURON, S.D. - The Number two seed DeSmet Bulldogs won the South Dakota Class B Girls Championship game Saturday night in Huron. It is DeSmet's first ever state girls' basketball title. The 49-39 win for the Bulldogs came againse a previously unbeaten Number one seed Ethan. Ethan fell behind early in the contest, and found themselves playing catchup the whole game. DeSmet, however, was able to maintain its lead through four quarters. Rynn Asthus led DeSmet with 15 points. Meanwhile, Corsica-Stickeny took third place with a 55-45 hard-fought victory over Freeman. Avery Broughton led the way for the Jaguars with 21 points. And in the fifth place game, Warner defeated White river 54-48.